Be at the top! View the superb panoramic of lowlands, hills, and mountains. Look at the rivers, spectacular grey-leafed Seraya trees in broad valley, Gunung Perlis and Gua Besar in Keniam. On clear days you can see Gunung Tahan, 2187M – height the highest peak in Peninsular Malaysia. It is only 1.7km from Kuala Tahan and the best place to introduce you about Taman Negara. You can reach there through the trail along of tall forest, secondary forest and scrub. The trail is passing on one of the best bird watching habitats area in Taman Negara. Hear melodious song of the white-rumped shama, call of straw headed bulbuls, babbler, drangoes, malkohas, hornbills, woodpeckers and etc. 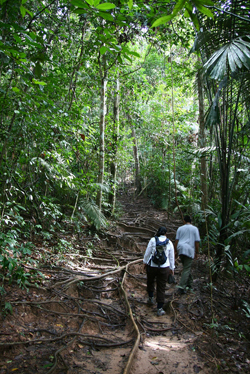 The trail to Bukit Teresek is divided into categories; are the flat and step part. You will begin your trekking from flat part which is not far from the river. It takes about 400m long in distance. The remaining distance you will be trekking along the steep part of the trail. It is quite hard and sweaty. However you will feel energized when you realized you are walking within the nature and under the green tall forest. Just take a short break if you need before continue your trekking to the ridge. Don’t forget to bring your drink, you might need to get your throat wet after a few meters walk. Mineral water is the best drink. Once you have finished your steep trail, you will be at the first look-out. There are sandstone exposed at this look-out is representing of the bedrock over most of Taman Negara. From that point you can see a section of Sungai Tembeling and Taman Negara boundary. Enjoy the panoramic view at the first look-out; then you can continue to the second look-out. You can reach at the second look-out within 10 – 20 minutes walk. From this point, look at a superb view to the north lowlands and hills to the high mountains in the centre of the Park. See at the river below. It is Sungai Tahan. Gunung Perlis (1280M) is more visible from the look-out. You can also view the Gua Besar in the Keniam valley. On clear days you also can see Gunung Tahan 2187M height- the highest peak in Peninsular Malaysia. See the spectacular grey-leafed Seraya trees in the broad valley running across between Tahan, Trenggan and Keniam rivers. Down the side of the hill is tall forest with a great variety of palms, including several kinds of rattans. Take your time and enjoy yourself at the top! You may return to Kuala Tahan by the same route (recommended) or via the path leading down to the left from the second look-out, to Sungai Tahan – this path is very steep. If you take the same route, parallel with the river, it takes less than 45 minutes to get back to Kuala Tahan.